October 19, 2018 January 14, 2019 ~ Mike K.
Having already seen where Return from Wonderland would take us, I was rather eager to see how the Grail legend would be represented in escape room form. There’s so much material there that it was hard to imagine what might be found in this escape room, but they told us to come back and try it out so who am I to refuse? We were in Williamsburg for a long weekend, and had booked the Return from Wonderland room. However, scouting the location’s website, I was VERY much intrigued about the Holy Grail room because the Arthur legend is one of my favorites. We had a good time in Wonderland, so when the opportunity presented itself to come back and do Grail at another point during the weekend, we HAD to do it. There’s a legend floating around the villages about a cup that could keep you young were you to drink from it. Not being one to be left out of a good story, you begin your search for this Holy Grail and find a castle it’s alleged to be housed in. You have one hour, however, to search through the castle and find the Grail, else be doomed to age like the rest of humanity. Rating: 7/10 The ancient myth of the Holy Grail has puzzled scholars for over 2,000 years, and intrigued generations as to how it related to the additional myth of King Arthur and his Knights. You are a team of archaeologists who are searching a castle that is rumored to contain the lost Grail. Unfortunately, while you were searching the castle, someone tripped a trap that will collapse the castle in 60 minutes. The mission was simple. Infiltrate the castle, search for and find the Grail, leave, and be Forever Young. Else, suffer like everyone else. 2 – Monty Python and the Quest for the Holy Grail. We didn’t really get either one; more a mishmash of both. And considering it’s never been found, it would have been interesting to see that incorporated into the story-line and room itself. Rating: 7.5/10 You have to quickly search the castle to see if you can find whether the myth is true about whether the Grail resides there. If you can’t find it within 60 minutes, the castle will collapse, kill you and your team, and bury the Grail forever (or at least until they are able to do some major excavations). Your overall mission was pretty clear, but you only have to find the Grail… that’s pretty much it. I don’t remember having to actually escape the room before the castle collapses, so maybe it’s assumed that you’re just going to drink from the Grail for its healing properties? But, what if you’re stuck in the room and the castle collapses… and you drop the Grail, or don’t have any water on you… or enough straws to go around for your team to all drink at the same time so you all don’t die. I’m going to rate them down a little bit here for a slight inconsistency. There was plenty to do in this room and some of the puzzles didn’t disappoint, making use of swords and rune stones. However, we did take issue with arguably the most time consuming puzzle in the room, the one involving the table and candles. We would later come to find out that it’s “finicky” (I believe that’s the word that was used), and that’s why it took so long to solve. We actually had it solved multiple times but were moving parts too fast to make the device trigger. Rating: 7.5/10 There was a pretty good mix of things to do in this room, ranging from some puzzles and ciphers, to manual manipulation of props, and some observational puzzles that required a lot of attention to detail. There was a good mix of the types of locks we found, so that was going for the room too. There was one type of puzzle, however, that seemed to be a bit overkill in how long it took to solve it. I’m all for adding a challenge, but not one for overkill with how much of the same thing you had to do to solve that one particular puzzle. The puzzle on the table in the first room, once we solved it, was pretty cool, although the tech glitched. I finally figured out how certain parts of the table worked and how it related to the overall puzzle. We’ve seen something similar before on a smaller scale, but this one was well done, even though we had a bit of a glitch with the tech. There was also a puzzle that required teamwork, so you definitely need at least two people in this room, and it was fun to work on to develop your communication skills. We only really stumbled in one spot, which turned out to be because we didn’t have all the pieces (for the last puzzle). Aside from, of course, the finicky lighting puzzle. Those two not withstanding, I can’t remember anything being terribly difficult. There were plenty of things we’d already seen (albeit in other forms) and a few things we hadn’t yet, but nothing to the point that we couldn’t crack them (that’s what we do, after all). Yes, the puzzle involving the table of swords was cool, but it was surrounded by so much deciphering of runes that (1) I can hardly remember what the puzzle was and (2) it took so long I didn’t get to see a good chunk of the first half of the room. Rating: 6.5/10 There was a good range of complexity here for the puzzles that ranged from easy to medium. I wouldn’t say anything was particularly hard, but I guess that time-consuming would be a good word. The other puzzle with the glitch essentially lost us about 10 minutes because we had it solved, but it wasn’t triggering and we had to ask the GM for clarification that we had it correct (because it was the last puzzle we had to work on without being able to move forward). Unfortunately, it took the GM about 5 minutes to respond to our inquiry, and then we got a cryptic response to our question as to whether the puzzle was working right. After another 4 minutes fiddling with it, we essentially had to say “is this supposed to do THIS, or NOT?” We got a confirmation that the one part was a bit finicky, so we kept messing with that one part until we got the puzzle to unlock. I did like how we were all able to solve certain puzzles on our own (the girls solved a number of puzzles while Jason and I were working on others, so we had to have them tell us about it). There were no direct references to King Arthur (other than the names of some of his Knights), which was kind of disappointing. But then again, this was a Holy Grail room not an Excalibur or such room. Rating: 7.5/10 I think that the decoration of the room was well done, and all the puzzles and locks did go along with the theme. One little criticism I’d give is that if this was an old castle where the Grail was hidden, it’s a bit too, um, well kept and clean. I’d also say that it would be cool if they had some sort of vibrating or rumbling effect somewhere because the castle is in a state of collapse… and maybe it gets a bit more persistent as you get further and further through your 60 minutes. I really did enjoy the puzzle with the swords and had been waiting for a room with this theme to do what you would EXPECT to do with swords based on the Arthurian legend (and we were lucky that we all got to participate), but I would have liked to have had a bit more of the Grail lore vs. more generic Arthurian legend. And there was only one, um, Excalibur. The room flowed well, and allowed us all to work on different paths until they came together… and then went back to some independent work again, so that would work well for small groups. I don’t think that you’d really need more than 4 people though. Other than the ‘finicky’ light prop, the room was ok. I was rather disappointed with the sheer amount of translation there was to do here, though. It was a fun room, and I had a good time, and I know that the girls enjoyed working on some puzzles on their own (I think this was the first room we’ve all done together where they felt that they were solving things left and right on their own), but there is a bit of room for some slight improvement here. I honestly don’t remember if we had any sort of interaction with the GM for this room. Our GM was pretty hands off while we were going through the room, and at one point a bit too hands off since it took us about 5 minutes to get his attention to figure out if one of the puzzles was operating properly. When he finally got back to us, he gave us a cryptic clue that set us back to double-checking our work. When we finally asked specifically if something was supposed to operate a certain way, he confirmed that it was, and we had to keep working on the puzzle until we got it triggered. See above. We only asked for clarification once, and the response he gave us wasn’t that helpful… until we asked again if we had something solved right. Rating: ? I didn’t feel stupid, but I was a bit annoyed with the lag time and the faulty trigger, so I’m borrowing Jason’s rating for this post. Final Thought: This was a fun room to play, not overly complex, but would be good for newer and younger players along with some experienced escapers. 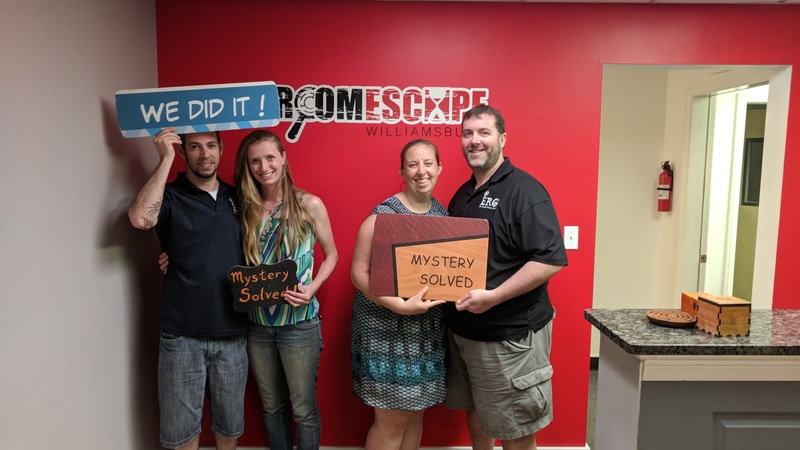 As we only got to do two rooms at this location, I’d say to do the Wonderland room if you have time for only one and want more of a challenge.